Your shopping business and loyalty are very important to everyone at Creek Side Gardens. We very much appreciate your patronage and certainly enjoy visiting with you to help make you the most successful gardener, decorator or gift-giver you can be. Or just to make your Creek Side shopping experience fun! To show our appreciation for your visit, we offer Creek Side Cash, the Creek Side rewards program. Everybody is eligible to participate and everybody enjoys the rewards of the program. The program is very simple. When you need flowers, gifts or gardening supplies, you shop at Creek Side Gardens any day in the month of May and receive a 5% rebate in Creek Side Cash, the Creek Side rewards program. You may then redeem your Creek Side Cash anytime in the months of July, August, September, October, November and December. Your Creek Side Cash may be redeemed on most any purchase, dollar for dollar during the last six months of the calendar year. The more you purchase in May, the more Creek Side Cash you will have to spend. Need a few mid-summer fill-in plants or fertilizer to spruce up your patio container gardens? When you use your Creek Side Cash, it won’t cost you a thing to keep your flowers looking fantastic. How about treating yourself to that special piece of home décor in the Indoor Living Shop you have had your eye on? No need to feel guilty when you use your Creek Side Cash. It’s a treat you deserve and it costs nothing. 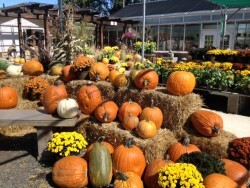 How about some fall pumpkins to decorate your porch? How about a Christmas tree? Yep, you can use your Creek Side Cash there, too! Creek Side Cash are Creek Side rewards offered to our loyal customers during the busiest time of the year, the month of May. You’re planning on shopping for that awesome Mother’s Day gift anyway, might as well shop at Creek Side, collect your Creek Side Cash and visit later in the year to treat yourself as well. There are only a couple of rules to follow: Creek Side Cash cannot be used to purchase sale items or gift certificates. They are not transferable to the following year. Either use them during the current year or lose them. Otherwise don’t let them burn a hole in your pocket, visit Creek Side Gardens later in the year to find what else we have going on throughout the seasons!